Using geometrics and bold patterns in your interior design scheme can be something which a lot of people are put off by, but in reality there’s no reason to be afraid. Working with such a diverse pattern and theme gives you a wide range of options for how to use it in your interior, due to the inherent versatility of geometric patterns. While a full geometric print carpet may be deemed a tad too garish or a step too far for some, a patterned rug will add a splash of colour and vibrancy to a room, setting a bold and eye-catching tone from the ground up. This works brilliantly with an oversized rug, although done correctly, a smaller rug can have an equal impact when used in conjunction with wooden flooring. Parquet flooring can also contribute to an interesting overall look if it is incorporated in a contemporary manner. When you’re decorating with a bold pattern or texture, try geometry or metallic textures. When using geometry, the angular nature of diamonds provides a neat, finessed look. For a modern aesthetic try a simple tessellated pattern, such as different coloured triangles, which, when placed back to back, give the appearance of shaded diamonds. Alternatively, you can go for a wall mural or vinyl sticker with overlapping shapes, creating different colours and a bright, lively feature for your wall. Low Poly Art is something which has risen to prominence quite quickly over the past few years, and involves images created using what is known as a poly mesh, a concept used in Graphic design and 3D Animation which allows a 3D image to be built around a polygon mesh, or base. This gives an animation physical properties and adds dimension. People have begun using this in art by creating a poly mesh image of anything from trees, mountains or even someone’s face. 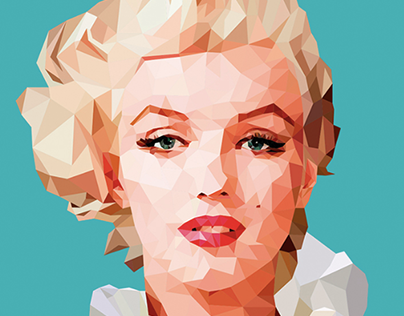 Low Poly art has become extremely popular for portraits, as well as for landscapes, blending nature with technology for a seamless and sophisticated look. You can bring aspects of geometry into your interior design scheme in several ways, and our Black Glass Classic wardrobe has an angular design which would compliment a geometric design scheme effortlessly.